How many borrowers have a mortgage and went to university? Data galore. How many borrowers have a mortgage and went to university? 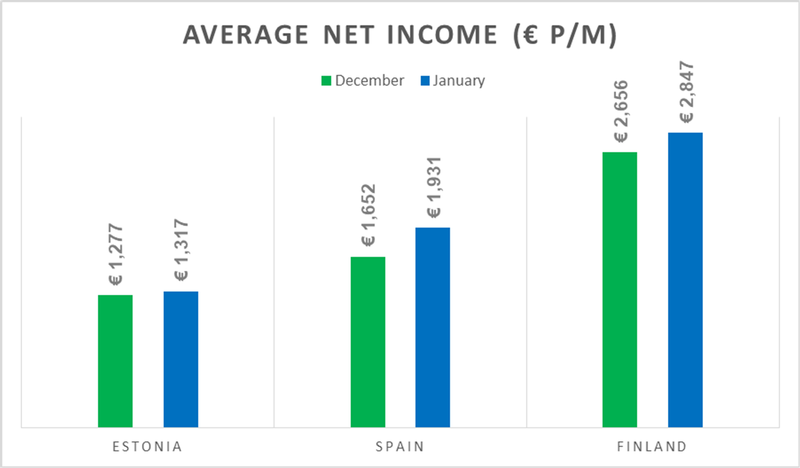 In January, the average net income figure increased across the board with the largest absolute increase seen in Spain. If you compare this data with our recent post on the share of credit grading’s per country, it is evident that income is not the only factor in determining the expected default rate when comparing Estonia and Spain respectively (For example, there is a much higher share of lower risk rated loans in Estonia than in Spain). Along with the increase in the average net income, the same is visible in the average loan amount. In absolute terms, the highest increase was in Estonia. 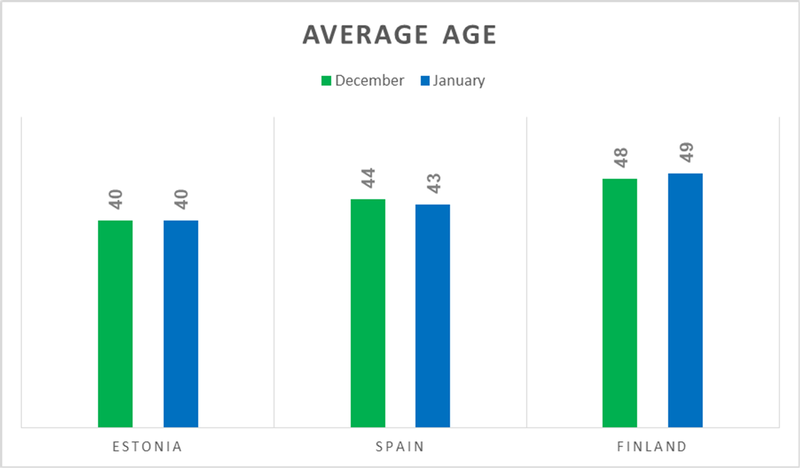 The average age of borrowers has changed slightly since December in Spain and Finland, however overall we commonly see the figures fall within the early to late 40’s range. 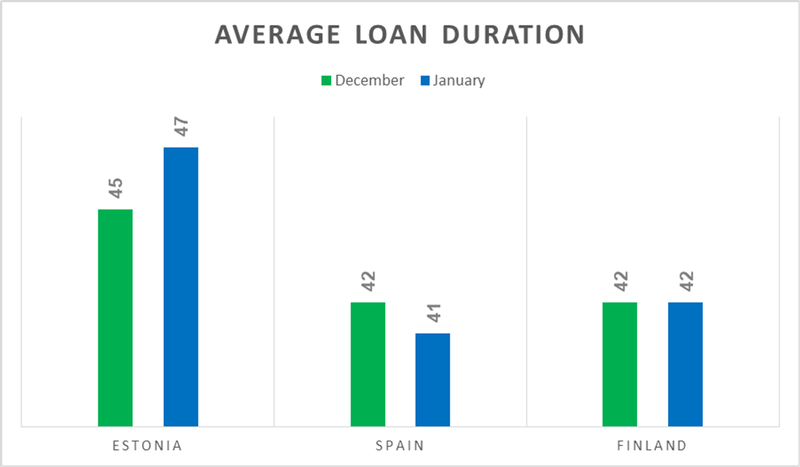 The average loan duration in January was higher in Estonia, lower in Spain and the same in Finland. For a more representative indicator, take a look below at the most common durations. Traditionally, Bondora has not focused on issuing short term loans and this is still clearly visible from the most recent data. 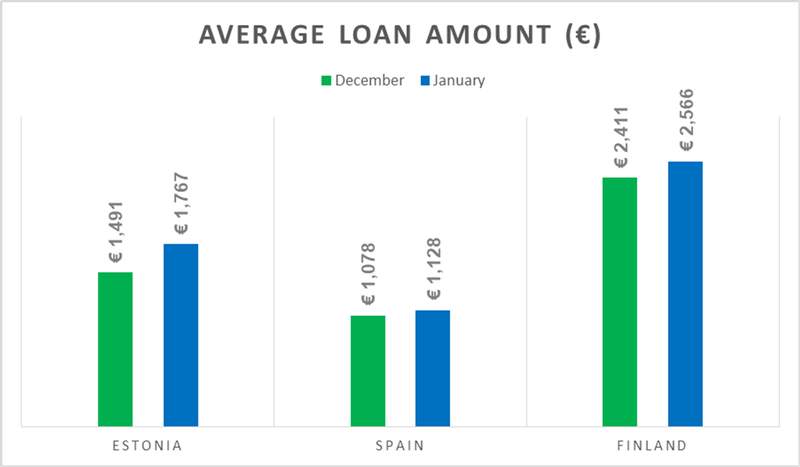 Only one loan in Spain was issued with a loan term of 3 months, whereas the majority of loans issued had a duration of 36 months or above. More specifically, the most common loan duration across all countries was 36 months, followed by 60 months and 48 months. Offering the option to take a loan with a duration of up to 60 months allows borrowers to have affordable monthly payments that they can budget for, along with their other expenses. Similarly to last month, the total most common type of education declared by borrowers is of a High School standard, followed by University, Vocational School and Junior High School. 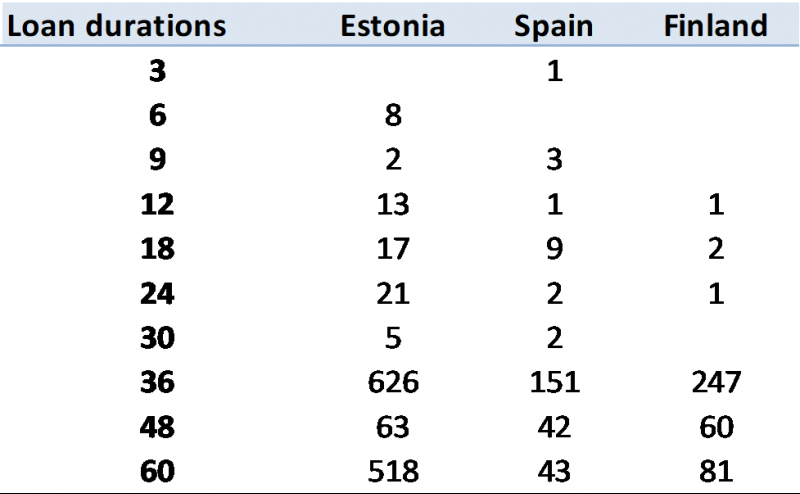 Per country, the figures show a different story; In Estonia the most common is still High School, however in Finland Vocational School is top and University in Spain. Whilst education curriculums and institutions also vary by country, it provides an interesting observation when compared with the other data points. The most common home ownership status in Estonia and Finland is ‘Owner’, in comparison the most common in Spain is ‘Tenant’. In previous months, ‘Living with parents’ has always been the most common in Spain so it will be interesting to see if this trend continues. Home ownership status can give us an insight in to the cultural differences between different geographies and how this can influence the wider economy. For example, in Finland only 5 borrowers were registered as ‘Living with parents’. In Estonia, just under half of all borrowers are owners of their home. The data below shows how many customer’s income and expenses have been verified. Regardless of whether the borrower’s income has been verified, the background checks with population and credit referencing agencies are still conducted. Overall, the total number of customers classed as verified are higher than those classed as unverified.